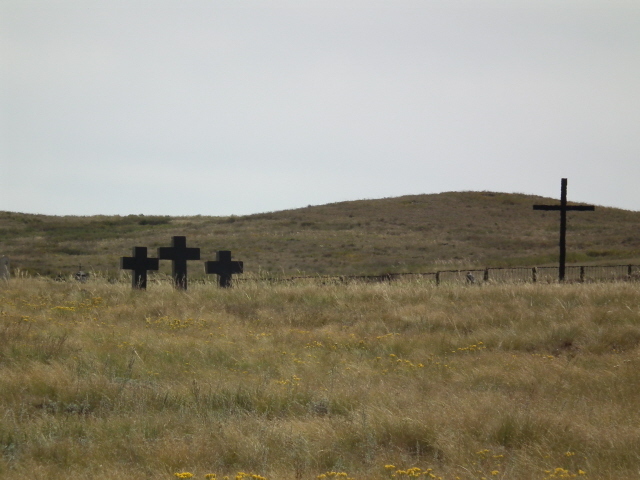 A cemetery-like ensemble of memorial stones dedicated by various nations to the gulag centre that used to form part of the KarLag system in east-central Kazakhstan. More background info: for background information about the gulag system in Kazakhstan in general see KarLag (and cf. ALZHIR). Spassk used to be a particularly infamous 'special camp' within this system, extraordinarily brutal (according to Solzhenitsyn's "The Gulag Archipelago") and with a particularly high death rate. There isn't an awful lot of precise information available on the Internet, but there seems to have been a separate women's camp at Spassk. Hard labour was performed in a nearby quarry. Apparently there had also been an uprising at Spassk (in the early 1950s?) which was violently crushed with the use of machine guns and tanks. What there is to see: there isn't anything of the actual camp left at all, although a nearby overgrown depression in the ground has been identified as possibly the camp quarry. Today, however, the only thing of note for the passing dark tourist is an ensemble of memorial stones, put up in a barren field in the low hills of the steppe south of Karaganda. The monuments are lined up at the northern end of a fenced-in open field that is regarded as a cemetery – a mass grave of sorts, with unmarked graves. Only a few uniform, unmarked sets of three low black crosses are set into the middle of the field, and a single tall and thin cross marks the far end of the field/cemetery. The memorial stones, on the other hand, are all of a quite individual design, some more traditional, others quite unusual. They have been erected here by or on the behalf of the governments of the various nations that the camp's inmates had come from, including Russia, Ukraine, Korea, France, Japan, Georgia, Azerbaijan, Lithuania … and, in particular of course, Germany. Belarus is only represented with a temporary (Orthodox) cross as a stand-in. Apparently a proper memorial stone is scheduled to replace this. The Israeli/Jewish memorial features a cut-out shape of a Star of David – which at first you might be tempted to confuse with a Soviet star (until you count the number of points – six, rather than five). In addition to the nation-specific memorial stones there is also a general memorial dedicated collectively "to the victims of repressions who found the [sic!] eternal peace in Kazakh soil". Location: ca. 20 miles (35 km) south of Karaganda, just off the main road to Balkhash. Access and costs: out in the hicks, but not too far from Karaganda by car; free. Details: if you can/want to drive it yourself, take the main southbound road out of Karaganda that leads in the direction of Balkhash. 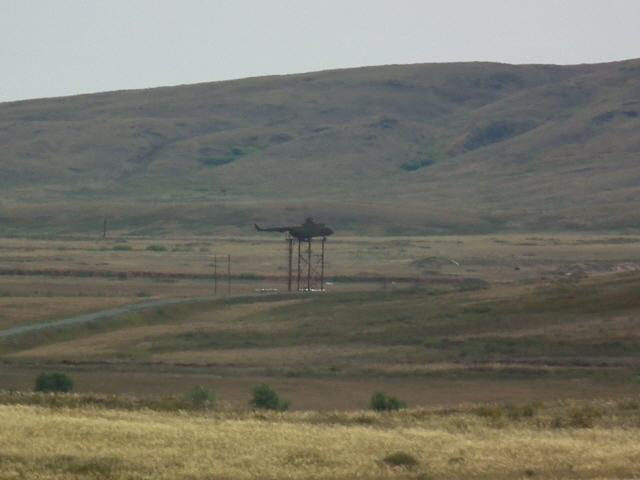 After some 20 miles (35 km) you pass on the right-hand side a large military range – first you'll spot a Mil Mi-8 helicopter on a tall stand of steel scaffolding (on stilts, as it were) in the middle of the field and shortly after a tank on a lower plinth by the road. Both apparently mark an artillery shooting range. The memorial complex and its car park are immediately opposite to the left-hand side off the main road where the tank stands. If you don't have your own means of transport, then a stop by the Spassk memorials can be incorporated into a longer half-day excursion from Karaganda (whose main focus is the KarLag Museum in Dolinka), as it is offered by e.g. Nomadic Travel, who are based at the Ecomuseum in the centre of Karaganda. To have this built into a more wide-reaching dark-themed itinerary of touring Kazakhstan, you might want to check out the sponsored page for the Dutch company Kazakhstan Tours. There do not seem to be any restrictions as to at what times you can visit, but only daylight hours make sense. Time required: not especially long. To just view the memorial stones (and read what you can – depending on how wide-ranging your knowledge is of the various languages that are represented here) you may take between 10 and 15 minutes, perhaps a bit longer for a few moments of quiet contemplation. Combinations with other dark destinations: to learn more about the gulag system in Kazakhstan the best place to go is the newly expanded and modernized KarLag memorial museum in Dolinka, west of Karaganda. The city itself also has a few further points of (comparatively minor) interest to the dark tourist. Combinations with non-dark destinations: none nearby – but see under Karaganda.